A Teeny Tiny Book About Martin Luther King, Jr.
King's Washington Speech 1963 - sound samples from the "I Have a Dream" speech. 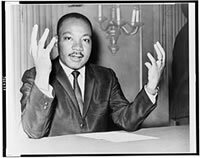 Lesson Planning Happy Birthday Martin Luther King! Seattle Times Martin Luther King Jr.
Sheryl's Holiday Site Martin Luther King, Jr.